During the 80s, it was common use to build computers in a way that they can output their picture on a TV set. This was done in order to reduce the overall system cost for the user. TV sets work with lower frequencies compared to today's monitors, therefore the picture flickers. A flickerfixer (aka de-interlacer) converts the signal in a way that a modern VGA monitor or TFT-display can be used. The name flickerfixer was mainly created because the problem of a flickering picture is solved. 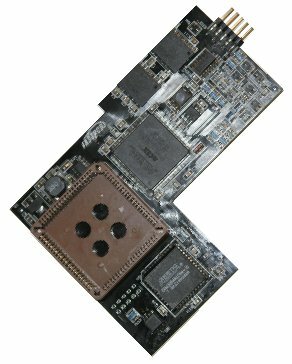 Individual Computers already had a very successful product called Indivision in 2002. It was connected to the monitor output of the computer, but it has been sold out since 2006. The first flickerfixers for the Amiga have already been available 17 years ago. Since that time, all flickerfixers have been using the same principle: The picture frequency was doubled. This is not enough for most modern VGA monitors and TFT displays, as the picture of a computer with PAL standard was only displayed at slightly less than 50 Hz. Most monitors require 60 Hz or more these days. Indivision AGA goes a new path. As the name suggests, it's a flickerfixer that is very closely tied to the AGA chipset. This could only be achieved by putting the flickerfixer inside of the computer. The product is mounted over the video chip "Lisa". The VGA display is connected directly to the flickerfixer. Further connections are not necessary. Please note that the Indivision AGA 1200 can only be used with an Amiga 1200 computer, it won't fit any other model. If you're looking for a flickerfixer for the Amiga 4000 or the CD32, please see our Indivision AGA 4000D/CD32 product page.